The Vatican Museums (Musei Vaticani), located in the Vatican City, are one of the attractions you must see on a visit to Rome. Here you will find priceless artworks, from Egyptian and Roman antiquities to paintings by the most important artists of the Renaissance. A visit to the Vatican Museums also includes the Sistine Chapel, where you can see Michelangelo's most famous frescoes. The Sistine Chapel. Renowned for its inspirational frescoed ceiling by Michelangelo between 1505 and 1512, the Sistine Chapel is also the gathering place of the Sacred College of Cardinals when they meet to elect a new pope. Portrayals of "The Last Judgment," "The Creation of Adam," and "The Fall of Man" and the "Expulsion from Paradise" are among Michelangelo's masterworks here, although he always considered himself more of a sculptor than a painter. The chapel contains what is considered by many to be the greatest achievements of the Renaissance. Tip: Go to one side of the chapel and wait for a spot to open up on one of the benches lining the wall. You can sit down and admire the ceiling without straining your neck or getting dizzy. The Raphael Rooms. Among the artistic treasures of the Vatican Museums, the four opulent suites that make up the Raphael Rooms are second in importance only to the Sistine Chapel. Painstakingly created by artist Raphael (Raffaello Sanzio da Urbino) and his students between 1508 and 1524, these galleries, located on the second floor of the Pontifical Palace contain huge frescoes—foremost among them "The School of Athens," which depicts the great philosophers of the Classical world. Raphael snuck in a self-portrait, in the guise of the Greek painter Apelles of Kos. The Gallery of Maps. One of the most popular exhibits in the Museums, the Gallery of Maps (Galleria delle Carte Geografiche) measures a whopping 394 feet and is plastered end-to-end with more than 40 full-size geographical paintings by the 16th-century Dominican monk and cosmographer, Ignazio Danti. Visitors to the museums pass through the gallery on their way to the Sistine Chapel. The Chiaramonti Museum. Set in a long loggia (hall) lined with thousands of ancient marble portrait busts, idealistic and funerary sculptures, as well as a rare 1st-century statue of Augustus, the Chiaramonti Museum is named after Pope Pius VII Chiaramonti (1800-1823). Pio-Clementino Museum. Housed within the smaller Belvedere Palace of Innocent VIII (1484-1492), the marble halls of Museo Pio-Clementino exhibit one of the world's most comprehensive collections of Classical Greek and Roman statues. A few examples are the Roman copy in marble of Apollo, originally cast in bronze in the 4th century BC, and a pontifical collection of sculptures housed in the crimson-hued Cortile delle Statue (today called the Octagonal Court). The Gregorian Etruscan Museum. Commissioned by Pope Gregory XVI in the middle of the 19th century, the Museo Gregoriano Etrusco has eight galleries that hold a fascinating selection of artifacts related to the mysterious Etruscan civilization, which predated Rome by at least hundreds of years. The Etruscans left behind rich grave goods, including bronze, glass, ivory, and ceramics found in ancient Latium and in cities across central Italy. The Gregorian Egyptian Museums. Founded in 1839, exhibitions in the Museo Gregoriano Egiziano demonstrate the importance and influence of the pharaonic culture in Roman history. See ancient mummies, delicate papyruses, and captivating pieces from the Near East, many of which were added to the museum's collections in the 1970s. The Gallery of Tapestries. At around 246 feet long, the Gallery of Tapestries (Galleria degli Arazzi) is just slightly smaller than its maps counterpart. Featuring beautiful vaulted ceilings decorated in delightful trompe l'oeil, the textiles were woven in Rome by the Barberini workshop during the reign of Pope Urban VIII. Pay attention to "The Resurrection," which is a wonderful example of a technique called "moving perspective." Look at Jesus' eyes as you walk by and you will notice that they seem to follow you as you pass. The Borgia Apartment. Another exhibit really worth seeing is the Borgia Apartment. Here Pinturicchio (formal name, Bernardino di Betto) labored for nearly three years (1492-1495) to fresco the private residence of the notorious Borgia pope, Alexander VI. During cleaning of one of his frescoes, "The Resurrection," a scene was revealed that is believed to be the earliest known European painting of Native Americans—the fresco was completed just two years after Christopher Columbus had returned from his travels to the New World. The Spiral Staircase. It's hard to visit the Vatican Museums without taking a photo of the elegant spiral staircase leading down from the museums was designed by Giuseppe Momo. Completed in 1932, the double helix flight of steps allows patrons to simultaneously walk up one side and down the other. The Vatican Museums collection "officially" began in 1506, when Pope Julius II purchased the "Laocoön," an ancient Greek sculpture depicting a Trojan priest and his sons being strangled by sea serpents, their punishment for trying to warn Troy about the Trojan Horse. The sculpture was put on public display, and the tradition of sharing Papal artistic treasures with the public was born. Over the years, the Vatican collections grew to more than 70,000 works of art, fewer than half of which are on display in the museums' more than 1,400 galleries, halls and chapels. It is one of the oldest and most-visited museums in the world and is also considered the world's largest museum. Hours: Monday-Saturday 9 a.m. to 6 p.m.; closed Sundays, January 1, January 6, February 11, March 19, Easter Sunday and Monday, May 1, June 29, August 14, August 15, November 1, December 8, December 25, December 26. From mid-April to late October, the Vatican Museums are open on Friday evenings too. 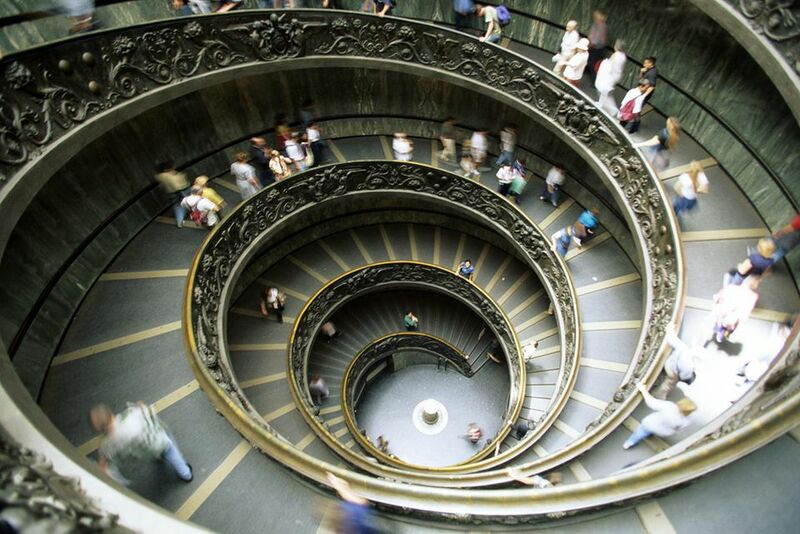 Free admission: The Vatican Museums are open for free on the last Sunday of every month. Exceptions include Easter Sunday, as well as June 29, December 25, or December 26 if they fall on a Sunday. Free admission to the Vatican Museums is also available on September 27 (World Tourism Day). While free admission to the Vatican Museums may be easy on your budget, be prepared for long lines for admission and crowds around all the famous artworks. Visiting Tip: Avoid the (very) long entrance line by buying your ticket in advance, within 60 days of your visit. You can buy tickets on the Vatican Museums website. Admission: €17 if purchased on-site; €21 if pre-purchased online (highly recommended). Check current prices on the above website. Admission is included in the combination Vatican Rome Card. With its crowds, miles of galleries and mind-boggling volume of artwork, there's no way to rush a visit to the Vatican Museums. Even the most fast-paced visit requires a minimum of 2-3 hours, and that's still not enough to do justice to these amazing collections. If you have a limited amount of time to spend in the museums or want to make the most of your visit, a guided tour is a great option. Guided tours can be booked through the Vatican Museums website, and some tours allow you to see parts of Vatican City not usually open to tourists. Generally speaking, the more you are willing to pay for your tour, the more privacy and exclusivity you obtain. Several private tour companies are licensed to offer small group tours inside the museums, which can include before- or after-hours access, skip-the-line options and behind the scenes access. Some well-respected tour operators include The Roman Guy, Context Travel, Select Italy and Italy With Us, all of which offer expert guides and exclusive access. For a really special experience, consider a before or after hours tour so you can see the Sistine Chapel without the crowds—truly a magnificent encounter. The Vatican Gardens. The Vatican Gardens, the most exclusive backyard in the city, can only be visited by booking a separate guided tour, either through the Vatican Museums website or with a private tour operator. It may take some extra planning, but it's well worth the effort, as access to the gardens is quite limited, leaving lucky visitors with little crowds for strolling the 57 acres of gardens in relative seclusion. Not only that, the well-curated gardens have the best views of St. Peter's dome in all of Rome. Vatican Post Office. Like the Vatican Gardens, the Vatican Post Office is not officially part of the Museums, however, if you have the opportunity we highly recommend you stop in to have a letter postmarked here. Given the Vatican City's unique status as its own tiny country, it posts more mail than any other post office in the world. Opened in 1929, it has its own stamps, along with a reputation for being so reliable that many Romans go out of their way to use it, too. Of course, most visitors the Vatican Museums combine it with a same-day visit to St. Peter's Basilica, one of the most important churches in all Christendom. Find out more about visiting St. Peter's with this visitors' guide.